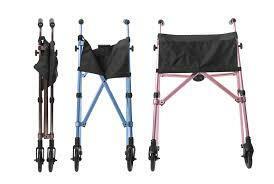 Ez Fold-n-go Walker. Weighs 3.6kgs and holds user weight of 180kgs. 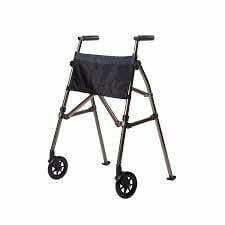 Easily folds 4 times smaller than the average walker. Adjusts to fit user height 4'10" -6'8". 6" front swivel wheels with easy glide back slides. Comes with a 2 pocket organiser pouch.